I’ll admit to being a little addicted to putting apps in my Mac’s Menu Bar. I went through a spell where I stuck every cool little gadget up there I possibly could, but finally got to paring down to only the most useful. Nearly all of these help with productivity or enhance day-to-day computer usage in some way. Here’s what’s in my Menu Bar from left to right. Calibre – I’ve mentioned it in passing before, but Calibre is my go-to app for converting eBooks from one file format to another. Some people use it to organize their eBook library, and it does have that function, but I find it too clunky to use that way. Calibre is available for OS X, Windows, and Linux. Twitter – Do I really need to explain Twitter? I tweet, I read tweets, we communicate in word bites. Done. MenuTab for Facebook – This is a neat little app that alerts me when I get likes or comments on my FB wall or any of my Pages. I can quickly see the comment, post a response, and get back to work without loading FB into my browser. Evernote – If you don’t know about this app, you’re really missing out. The Evernote folks aren’t kidding when they say, “Remember everything.” There’s pretty much nothing you can’t save to Evernote. Write yourself plaintext notes and save them, save whole webpages—even converting them to PDFs on the fly, save images, save everything. Like Skitch, it’s all in the cloud and accessible from anywhere. You can log in via your browser, the dedicated application, or even their smartphone/tablet app. Dropbox – I talked about Dropbox here, so rather than repeat myself, I encourage you to go read if you’re wondering what Dropbox is all about. Long story short, it’s a great online backup service that gives you 2 GB of space for free, and has very affordable subscription rates if you need more space. If you’re not backing up your important files, you’re setting yourself up to lose them forever. Gmail Notifier – This one’s simple. This little notifier sits in my menu bar and quietly checks my email status every few minutes. When something new hits my inbox, it turns red and gives me a cheery little beep. No more checking my email every 10 minutes to see what’s new. Now, I ignore the inbox unless alerted. Bowtie – This is pretty much the only frivolous app in my menu bar. Bowtie works with iTunes, placing a nice little graphic on my desktop showing me the currently playing song, the artist, the album cover art, etc. There are loads of user-created skins you can download to better fit your desktop’s style. Alfred – Oh, how I wish I’d started using Alfred sooner. Alfred is hands down (in my opinion) the best launcher on the Mac OS. It works similarly to Apple’s Spotlight, indexing the contents of your computer so you can access them more quickly. You setup a simple key combo to launch the app—in my case Option+Spacebar—and a little bezel pops up. You start typing the name of what you’re looking for, and Alfred brings up a drop-down menu of potential apps and files. For instance, when I want to launch Scrivener, I hit my key combo, type an s and a c, and Alfred brings up the list of possibilities. It’s smart and prioritizes applications at the top of the list, and also learns your habits. If you have more than one app that starts with the same letters, it pays attention to see which one you launch most often and moves it to the top of the list. In most cases, you can hit your key combo, type one or two letters then hit enter. It may sound like a lot, but it’s actually quite a bit faster than moving your hand to your mouse, finding the appropriate icon in your Dock and clicking it. FreeMemory – This little app sits in my menu bar out of necessity. Safari works better on my Mac than any other browser, and I prefer the interface over Firefox and Chrome. (Not to mention that Chrome runs like a bloated pig on my computers. Opps, I just mentioned it…) The problem is that Safari has a VERY significant memory leak, slowly allocating more an more RAM to itself the longer it’s running. The simple solution is to just quit Safari and relaunch, but sometimes that’s not practical. Free Memory keeps track of how much RAM is being used up, then forces the OS to free up that RAM when you hit a predetermined limit. Flycut – Flycut is a clipboard manager. What’s the clipboard you ask? It’s that little space in your computer’s memory where the last thing you copied (to paste elsewhere) is stored. Computers only remember the last item you copied. Flycut lets you store a predetermined number of items to allow you to paste them again and again. I’ve got my Flycut set to remember the last 40 items I copied, and the app displays the last 10 in a drop down menu for me. When I want to paste an item I copied several copies ago, I just choose that item from the menu and it’s pasted wherever my cursor might be. Flycut also syncs with Dropbox, so if the power goes out, you still have access to the things you copied before the outage. Droplr – This is my app of choice when I want to quickly share files with others. Honestly, this is a choice of preference. It just fits my workflow better than the common alternatives like email attachments, or a shared Dropbox folder. I like that Droplr shows me how many times the shared item has been accessed right there in the menu bar’s drop down menu. CPU LED – This one’s there as a bow to my geek nature. It really doesn’t help me get anything done, but I like knowing the load status of my CPU and RAM. That’s it. That’s all it does. Caffeine – This app allows you to keep your Mac from going to sleep, dimming the screen, or starting screen savers without delving into your system preferences and tweaking your settings. Want to watch a movie on Netflix and not worry about the screen saver interrupting? One click and you’re good to go. There you go. I’d encourage you to try these apps out and see if they help you be more productive, or make using your Mac a more enjoyable experience. What are your favorite Mac menu bar apps? Please let me know in the comments. What can I say about Scrivener? I had heard of the app before, but it was drawn back to my attention as a result of participating in NaNoWriMo. One of the special offers for winners this year was 50% off the purchase price. I downloaded the 30-day trial near the beginning of the month, but I admit I didn’t play with it much at all until the last few days of the contest. Now I wish I had used it all along. I had long searched for a good piece of writing software, and had finally settled on using Apple’s Pages. It wasn’t perfect, but at least it was stable, and kept me away from Microsoft products. My biggest complaint about Pages is that it’s such a RAM hog. I have to turn off so many features just to get it to run without sluggishness, and even then it can really allocate way more processing power than a text editor should. My MacBook’s fan was very often running at full speed while typing up my manuscript. Scrivener has none of those problems, and has more built-in tools than I’ve found a use for yet. I’ve completely switched all my works over to Scrivener. The only thing I’ve found lacking in the program so far is mind-mapping. That’s no great loss since I don’t do mind maps often enough to make firing up another app a real chore. 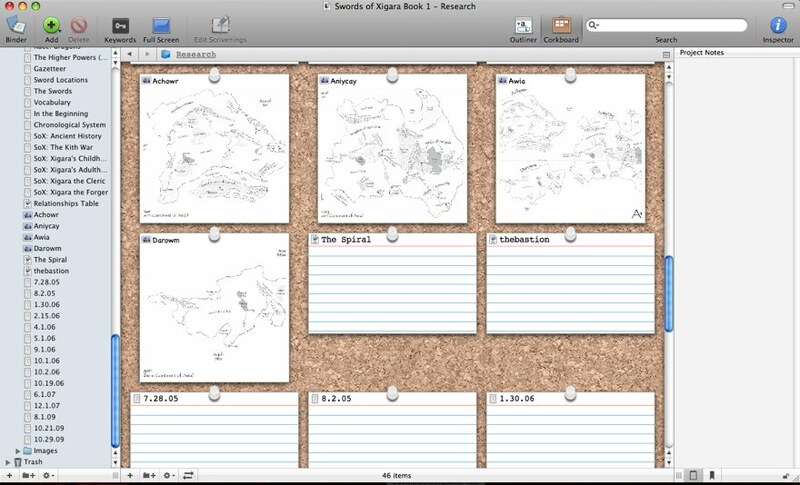 I’ve not done it yet, but once I’m done with my first draft of the novel started during NaNoWriMo I will be taking some time to convert a whole expandable file of 3×5 note cards into Research documents within Scrivener. You can see in the screen shots below some of the ways you can operate. For my high fantasy trilogy’s manuscript, I’ve been able to import not only notes, but also the PDFs of the maps I created. You can import several different types of image and text files for use in your Research folder. Though I didn’t think I would like it at first, I’ve come to appreciate the idea of splitting each chapter into separate files within the Manuscript folder. Though it will mean a little bit of extra work when it comes time to create a final manuscript, it’s really easy to do so. It’s a snap to click through the individual chapters in the left-hand pane, while the right-hand gives you a view of the synopsis note card and some other bits of information. The word and character counts are conveniently located at the bottom of the screen. 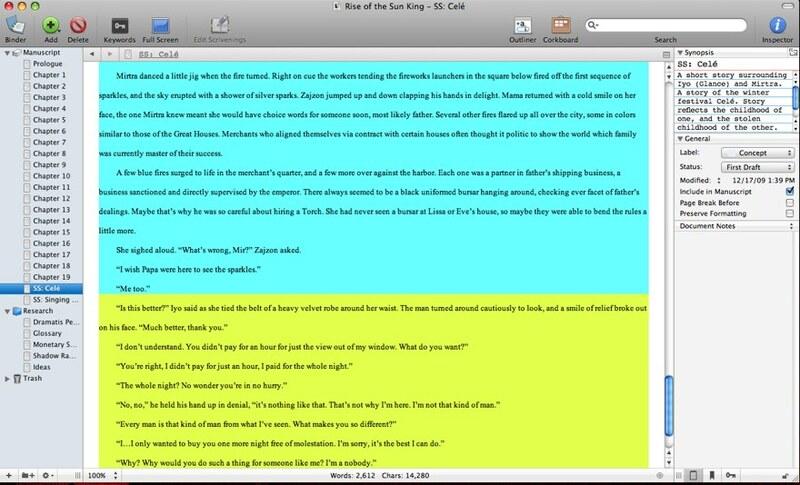 Scrivener also makes highlighting text a cinch. In the example below, you can see me experimenting with highlights. 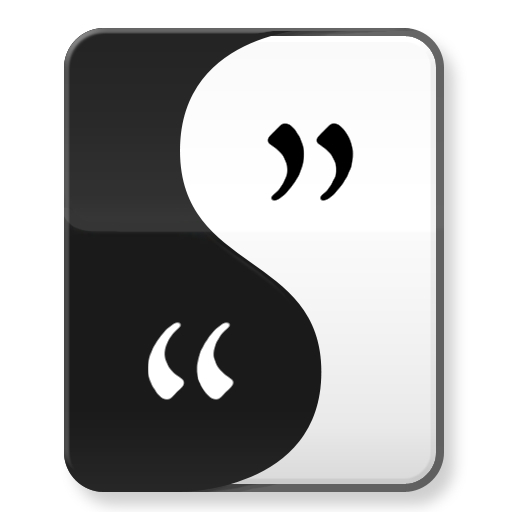 I’m trying to write a short story from two different points of view—usually a big no-no. One of the reasons I think I might be able to pull off two points of view is because of Scrivener’s highlighting ability. It helps me keep the two points of view straight and completely separate from one another. The theory is that if the author is never confused by the alternating points of view, then the reader has a better chance of not getting confused. I can’t recommend Scrivener more highly. If you are a writer of any kind, and use a Mac, you should give Scrivener a serious look. You can download a 30-day trial from Literature and Latte.